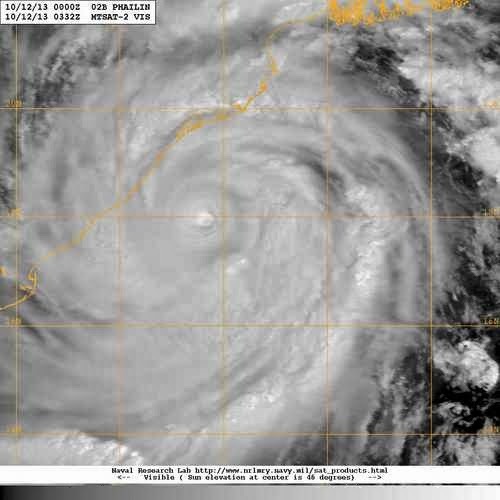 Super Cyclone "Phailin" to make Landfall between 6 pm and 6.30 pm IST..now located about 25 kms Southof Ganjam (approximate on Sat imagery)..as on 5.30 pm.. Located at 18.2N and 85.5E, it has maintained same strength at 920 mb and 260 kmph. 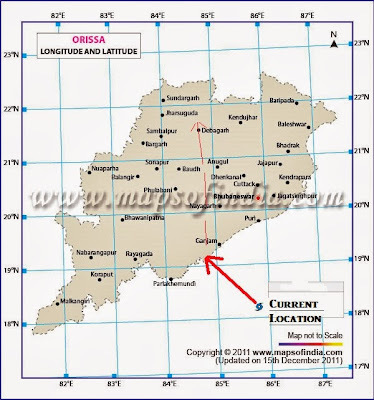 Now, approximately 110 kms from Land , it can cross the coast ( Just South of Gopalpur) at around 7 pm IST, seeing the current speed of tracking. 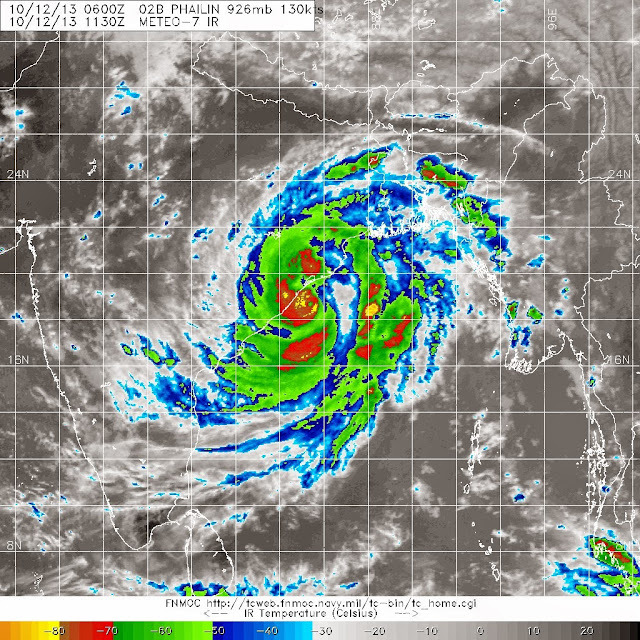 Before hitting land, clouds will get concised, and system will weaken rapidly on Land. 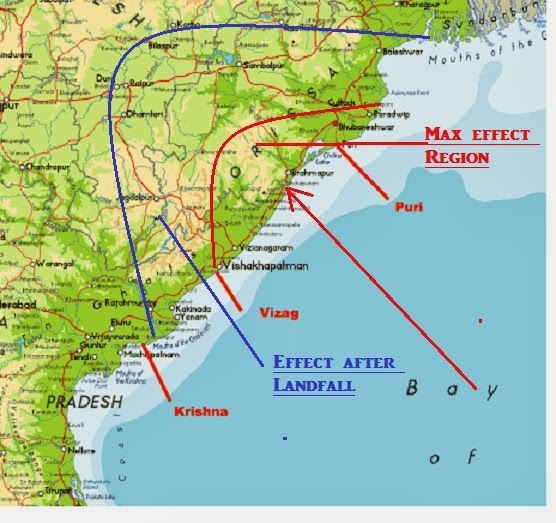 The movement after landfall will be almost Northwards. This is due to the active WD now in the North. Last 24 hrs ended Saturday morning, there was good rainfall in Punjab with Amritsar getting 67 mms, And in HP Dharamsala got 56 mms, Manali 14 mms, Delhi SJung got 39 mms, Palam 22 mms and in West UP, heavy rainfall in Hindon of 54 mms, and Meerut getting 13 mms..Jammu got 9 mms. Many places in the region recorded upto 10 mms of rain. "Phailin" at 918 mb and winds at 260 kph, is Categorised at 5. The eye is stable no doubt, but very strong convection in the eye walls are again producing violent thunder storms around the eye, and has formed a broken ring around it. If, (doubtful), a second eye replacement takes place, the system will weaken 10 notches by landfall. If not, it will remain at current strength, and strike North AP/Odisha coast at 920 mb and 260 kmph wind force.That is itself devastating ! Wind shear in the SW and South quadrant has increased to 40 kts, so translating to more vigorous thunder storms in that quadrant. 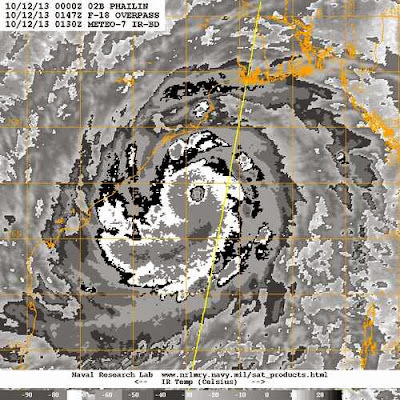 (See IR BD Image). sir what would be the effect of phalin in mumbai or maharastra.do mumbai get heavy rain from today evening. Nilesh: Storm approaching Orissa, sow very heavy rains and winds, as system tracks N/NE...Valsad can be cloudy with possible shower..ains decreasing from next week.